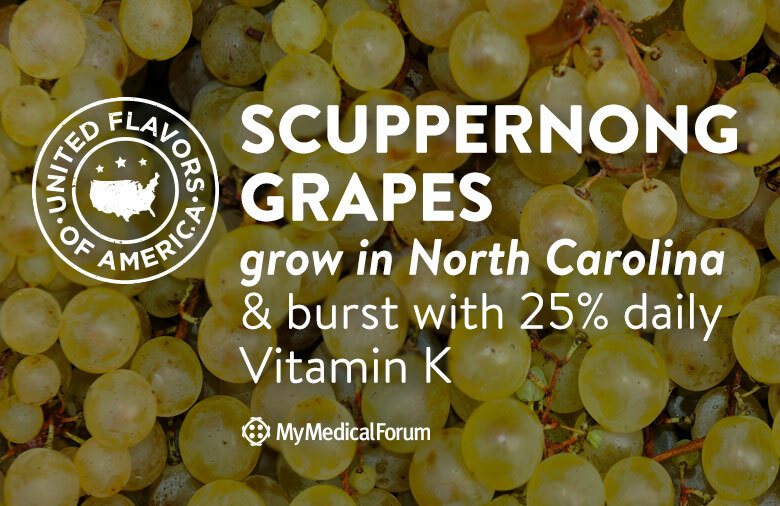 Scuppernong grapes ­– like the ones that are bursting this time of year in North Carolina – are loaded with Vitamin K and antioxidants that counteract free radicals in the body and help reduce inflammation. These powerful antioxidants are especially beneficial for the cardiovascular system, where they can help reduce the risk of plaque building up inside the arteries. They help regulate blood sugar and have been found to support brain health, as well. Scuppernong grapes also contain a wealth of phytonutrients – such as resveratrol – that work with certain genes that increase longevity. If that’s not enough already, scuppernong grapes also have been found to help reduce certain cancer types – breast, colon and prostate. Now that it’s grape-harvesting season, try this refreshing way to get all the health benefits scuppernongs have to offer, while passing on store-bought ice cream, often high in fat and preservatives. Stem, wash and mash grapes. Strain and reserve juice. Boil hulls and pulp in water for 20 minutes. Strain, then combine with reserved juice. Add agave nectar and lemon juice – adjust amounts for taste. Use ice cream maker to freeze.